Joseph Gurt, whom the New York Times has described as having “all the assets of a first-class pianist”, has had a distinguished career as solo pianist, chamber musician and teacher since his graduation from the Juilliard School of Music. In addition to the United States he has performed in Australia, Canada, Turkey, Israel, Taiwan, Hong Kong and Singapore. His playing has been heard in Carnegie Recital Hall, the Library of the Performing Arts at Lincoln Center New York, and at Orchestra Hall in Detroit, as well as on many university campuses in the USA, Taiwan and Hong Kong. Among his recordings are the Piano Quartet of William Bolcom, Anthony Iannaccone’s Partita for Piano and his Two Piano Inventions. Since 1967 Joseph Gurt has served on the faculty of Eastern Michigan University where he retired as Professor of Music. He continues to teach and perform and recently played for the American Liszt Society at the Library of Congress in Washington D.C. His experience in the Taubman approach has enabled him to find successful solutions to piano-related injuries and technical problems. He served for many years on the permanent summer faculty of the Dorothy Taubman Institute of Piano. Alexa Lokensgard has sung Lauretta in Puccini's Gianni Schicchi, Alma in Lee Hoiby's Summer and Smoke, Venus in Cavalli's Egisto and the title character, Treemonisha, in Scott Joplin's ragtime opera. While she was a Young Artist at Michigan Opera Theatre, Alexa sang the roles of Anna in Verdi's Nabucco, Mrs. Segstrom in A Little Night Music, Papagena in The Magic Flute and the Page in Rigoletto. Alexa holds degrees in vocal performance from St. Olaf College (B.M.) and New England Conservatory (M.M.). Pianist and accompanist, Jean Schneider is the repetiteur for Michigan Opera Theatre in Detroit, where she has worked under the batons of some of the world’s best-known opera conductors. Ms. Schneider works with numerous Detroit metropolitan area ensembles as rehearsal pianist, including the Choral Union of the University Musical Society in Ann Arbor, and is in demand as a vocal coach. A gifted recital accompanist, she performs frequently with singers throughout North America, Europe, and Asia. Ms. Schneider holds Masters degrees in Piano Performance and Piano Accompanying from The University of Michigan School of Music, where she studied with Eugene Bossart. Martin Welter started playing the violin at the age of ten in Marburg,, a small university town in Germany. He perfected his violin studies at the Music Conservatory in Munich, Germany, and received private lessons with Lydia Dubrovskaya, a master-violinist from Russia. He has ample experience with the early music movement in Europe; for some years he was a member of a Gipsy Swing Jazz group, and of a Palm Court Orchestra. He decided to continue to play music, not as a professional, but as an advanced amateur. He now mostly works on projects with a classical String Quartet and various orchestras in Munich. Martin is thrilled to be a part of this evening. 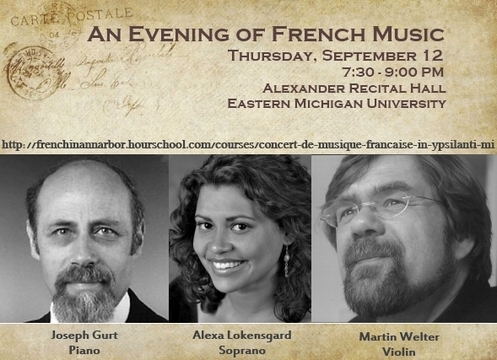 As a Francophile himself, he is very happy to help promote French in Ann Arbor. Jean-Marie Le Clair, Rameau, Couperin, Fauré, Saint-Saëns, Massenet, Chopin, and more. Free concert. Donations for French in Ann Arbor are welcome. Expanding my enjoyment of French culture. Just back from a wonderful week in Paris (12/8/13)!! Courses and subjects have been counted for the help of the students. The range of the course and my assignment help review is accentuated for the formation of the complete tinge of the regulations for the patent rights of the people. Quelle soiree agreable! Merci a Joseph, Alexa, Martin, pour nous avoir mis du baume au coeur comme on dit ;) La musique adoucit les moeurs, et bien d'autres choses :) Merci a Mijo pour toute cette preparation! A refaire!! Lovely evening. This was a memorable evening! We listened to three artists who enchanted us. Joe and Martin, you both harmonized so well and effortlessly that we were easily transported to the aristocratic evenings of the time. And, as Brigitte said to me right after the Django Reinhart's "nuages": "I felt I was in Paris..." Alexa, what a treat to hear your beautiful voice on the French repertoire. You were wonderful. Joe, your Chopin piece was breathtaking, literally. Finally the three of you in "Summer Time" played a beautiful conclusion to a glorious evening. My gratitude is immense. In addition, Joe, thank you for all you did for the organization of the concert through EMU. Un succes! C'etait superbe! What a treat. Thank you Joe, Alexa and Martin for sharing with us your work, talent and passion. Thank you, Mijo, for all you did. This is truly appreciated. It was a wonderful evening. From Ann Arbor take either 94 E or Washtenaw. For 94 get off at Huron St exit and go North to Ypsilanti. You will pass Michigan Avenue, Cross St and Forest Ave. The next street is Jarvis where you turn left. Continue on Jarvis past Lowell, and the Alexander building is on your left. For Washtenaw continue to the end where you turn Left on Huron. Turn Left on Jarvis and continue on Jarvis past Lowell, where the Alexander building is on your Left. You turn left from Huron St to Jarvis st and continue to the traffic light, after which the you reach the EMU campus. On the far side of the light the first building on the left is the Alexander Music Building. Immediately after passing the light, and before getting to the building itself there will be an entrance on your left to a paid parking lot. Any other parking may result in a legal penalty.